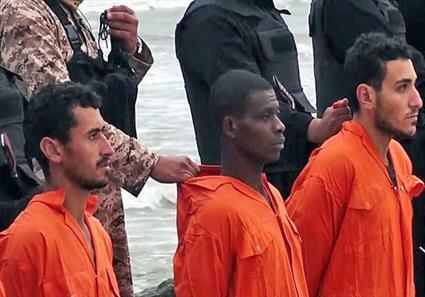 Today I remember the “21 Coptic Christian men,” martyred on a Libyan shoreline — February of 2015. I’m mindful of their families; wives, children, mothers, fathers, and those who love them, — all living in the shadows of persecution. I think of a small dusty village; al – Our in Egypt’s Minya Governorate — home to thirteen of the twenty one men. While it was reported that all of the men where Coptic Christians from poor villages in Upper Egypt; it was later discovered that this wasn’t the case. One of the men martyred that day was identified as Mathew Ayairga; a young man from Chad. He is believed to not have been a Christian before kneeling in the sand beside the ‘people of the cross.’ Witnessing the courage and faith of the Egyptian Christians he also chose to follow Jesus. Mere moments before Matthew was executed, His executors are seen asking “Do you reject Christ?” His reply was “Their God is my God.” Matthew joined his brothers that day — and laid his life down alongside them. He and the other 20 men joined the ranks of those of whom the world is not worthy. I can only imagine the reception they received as they stepped out of their earthly bodies and took in their first breath of heaven. 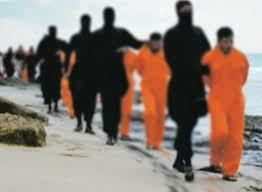 The martyrdom of these 21 men by IS sparked the Bible Society of Egypt’s biggest campaign ever. A Bible tract was created and sent to print within 36 hours following their public executions. Titled “Two Rows by the Sea,” it carries a message of hope, comfort, and forgiveness for both Christians and Muslims alike. 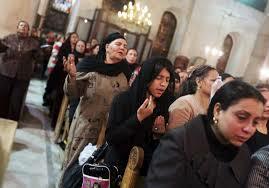 The Bible tract has been widely received in Egypt with 1.6 million copies being distributed immediately. The vivid video footage depicting the killing of the 21 men did not spark division among Egypt’s population consisting of approximately 10 percent Christians and 78 percent Muslims. Quite the contrary. 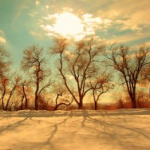 The declarations of faith uttered by the men only moments before their death; created fertile soil for conversations between Muslims and Christians. “I’m proud of my son. He did not change his faith till the last moment of death. I thank God. 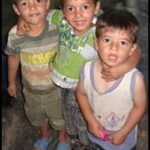 Malak is with his father now. Jesus. He is taking care of him.” – The mother of 25-year-old slain laborer Malak Ibrahim. This month in the same village; al – Our, Egypt, a church was dedicated in memory of the 21 men, — al – Shohadaa’ (Martyrs) church. Families of the men began planning for a church in their honor shortly after their deaths. The idea of a church being erected in their honor was not welcome by many in the village and surrounding areas. In the initial planning stages the idea was met with Molotov cocktails and an angry mob. Today the dreams of the martyrs families are alive — in a church dedicated to their sacrifice. There are hopes of bringing the remains of the men, (identified in a mass grave on the shores of Libya), to rest in the church building. Evil can inflict pain, suffering and temporal death upon Christians, but — it can never kill their stories. The testimonies of Martyrs echo through the halls of history. Their music can’t be silenced. Songs of love, faith, courage, and forgiveness. Sounds that can be heard in the surrender brought about by the blood of the martyrs. Its melody piercing the most calloused of hearts. Moving it’s listeners to their knees, and leading them to the cross. There is a beautiful finale to the persecution of Christians —this is the other side of Martyrdom — seen only through spiritual eyes and on the other side of eternity.